Pakistani opposition leader Shehbaz Sharif has been arrested as part of a longstanding corruption case nine days before crucial by-elections are due to be held. It comes just months after his brother, ousted prime minister Nawaz Sharif, was sentenced to 10 years in prison for corruption after the Supreme Court removed him from power. The corruption allegations against Shehbaz Sharif relate to a low-cost housing scheme, known as Aashyana (Shelter), he oversaw as chief minister of Punjab province. Maryam Aurangzeb, spokeswoman for the opposition Pakistan Muslim League-Nawaz, said his arrest was politically motivated. Information Minister Fawad Chaudhry welcomed the arrest and offered the agency any help it needed. “This step today is a big step,” he told reporters. The former prime minister was arrested 10 days before the July 25 general election, which was won by former cricket star Imran Khan, who campaigned on an anti-corruption platform and now leads the new government. The Sharifs’ Pakistan Muslim League-Nawaz came second in the election. Their party, along with all other major opposition parties, denounced the polls as rigged, alleging the military and courts of tipping the scale in favour of Mr Khan’s party. Nawaz Sharif was released from prison last month pending an appeal against his conviction. Both brothers deny any wrongdoing. By-elections to fill 11 parliamentary seats and 19 provincial assembly seats are scheduled for October 14 and could affect the ruling coalition Government’s slim parliamentary majority. Though many of the constituencies are considered strongholds of Mr Khan’s Pakistan Tehreek-e-Insaf (PTI) party, the main opposition could wrest back control of Punjab. 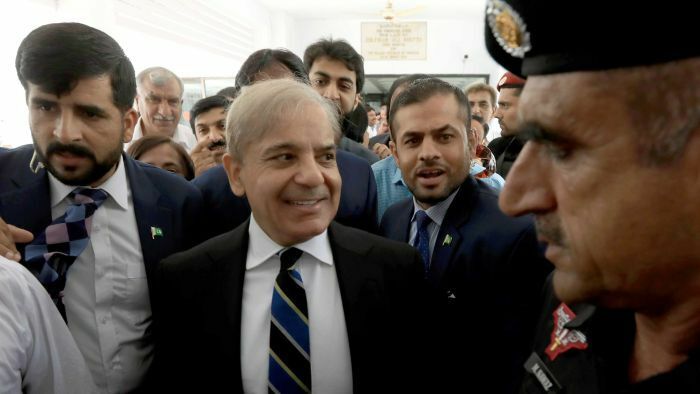 The country’s anti-graft agency, which announced Shehbaz Sharif’s arrest, said he was due to appear in court on Saturday.